Was Judge Dredd (1995) Really That Bad? Verdict: 2 / 5This really could have been a good film if only it had been a Judge Dredd movie. On June 30th of this year, it was the 23rd anniversary of the feature film release of Judge Dredd. Did you notice? Probably not. Even if you’re a die-hard fan of 2000AD’s lawman, odds are you wouldn’t have cared simply because the first film with him was a bit of a stinker. When I originally saw it at the cinema I hoped for something special. Instead, I felt ripped off. To be fair I still watched it a few more times, desperately hoping that it would improve with repeated viewings. It didn’t. I left it alone for quite a while after that, and it didn’t even have the guilty pleasure factor for me that other bad movies like Street Fighter have. I haven’t seen Judge Dredd in years… Until now. The story is pretty simple. Judge Dredd is the satirical fascist lawman of the future, and all he wants to do is his job. But when his evil clone brother Rico escapes from jail and frames Dredd for a murder he didn’t commit, Dredd is found guilty and sent to a penal colony. Not that he makes it there, of course. His ship crash-lands in the Cursed Earth, the irradiated wasteland outside of Mega-City One. The strange thing is that the film starts out pretty well, if you can get past the ridiculous armour and codpiece that the Judges wear. After battling the Angel gang (including Mean Machine), Dredd makes his way back to the Big Meg to take down Rico and the corrupt Chief Judge Griffin. The villains’ plan? To bring a new totalitarian order to the city by unleashing an army of clone Judges. With Dredd struggling to understand how the law could have failed so badly, can he save the day? That sounds pretty good on the surface, as far as plots go. The strange thing is that the film starts out pretty well, if you can get past the ridiculous armour and codpiece that the Judges wear. Dredd himself starts out in great form, wiping out perps in a block war and dispensing summary justice in a tongue-in-cheek fashion that’s pretty close to the comics. Also, Mega-City One looks good, resembling the world of Blade Runner to some extent. Then it all goes wrong. Almost on cue with Dredd taking his helmet off (something readers know he doesn’t do!) the whole story goes off the rails. Fans want to see Dredd being, well, a Judge. Instead, they strip him of the costume and helmet, and instead of dispensing justice he’s just a typical action movie guy on a quest to beat the bad guy. Oh, and he’s given a “funny” sidekick. Appearances by Mean Machine and Hammerstein (from the ABC Warriors) brighten up otherwise dull moments, while Armand Assante as Rico is inspired, but the whole thing feels flat. 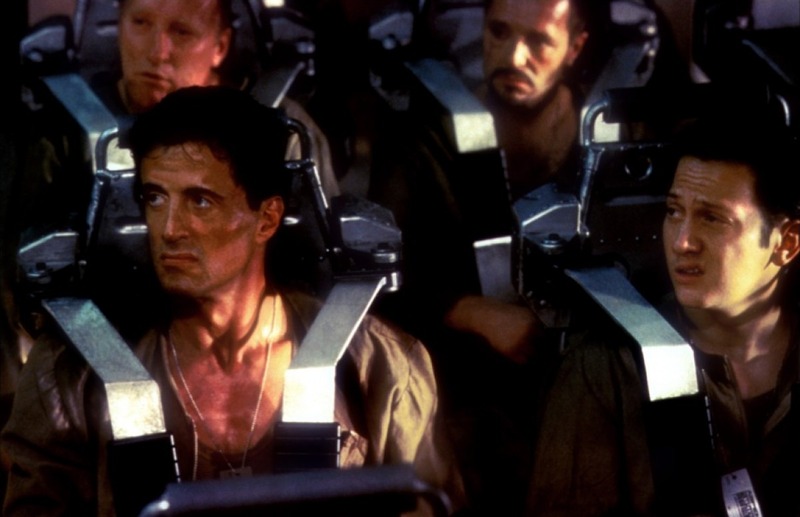 As for Stallone’s performance, it’s almost embarrassing as he tries to deadpan some lines and attempts to emote. He even smiles a little after Judge Hershey kisses him. It’s everything the fans never wanted. Oh, and the violence is of a PG-13 level so it’s mostly harmless. Logically, it’s never quite made clear just what Rico gets out of causing mayhem for Griffin. He’s chaos incarnate, similar to the Joker, and he’s happy to help tear the city apart. But since Griffin’s goal is to create ultimate order, their goals seem so incompatible that it’s little surprise Rico turns on the Chief Judge. The mystery is why Griffin never saw it coming. This really could have been a good film if only it had been a Judge Dredd movie. Stallone himself described it as a missed opportunity and you can see his point. It really did have potential, which apparently he squashed at the time by not letting the director tell a story which the fans wanted. At times – especially early on – you can see how good it could have been but it doesn’t last. It’s been 23 years since this came out, and time hasn’t improved Judge Dredd in any way.